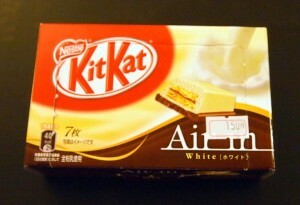 Review: “Air-In” Kit Kat White | Oyatsu Break! Back on Friday January 19th, I promised you all that I’d be back with a review of the other new “Air-In” Kit Kat, white-chocolate, on the Monday following. Today being March 12th, you may have noticed that I did not. 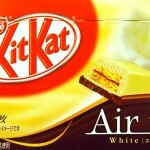 Well, I’m back to let you know that we’re about to take a journey down the path of the Kit Kat Air-In White, the brand new sort of Kit Kat that mixes the wafer/flavour goodness with the micro-bubbles of Aero (or Mirage) bars. 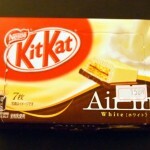 I was powerfully unimpressed with the Green Tea air-in Kit Kats, lets see how White fares? Packaging: As always with the smaller boxes of Kit Kats, the packaging on this is pretty elaborate. A cardboard box containing 7 individually wrapped Kit Kat fingers, the box is resealable and perfect for portion control–buying a box and keeping it at your desk for a week–or for sharing with friends or coworkers. 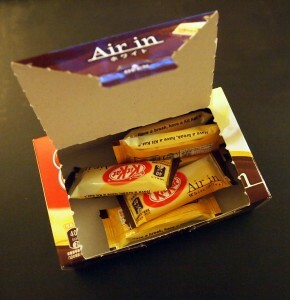 At only 150 yen for this box, that’s about 22 yen, or 25 cents, for a little bite of chocolate, which makes this an extremely attractive snack for the cost conscious and Kit Kat fans alike. The box is also resealable, and features elaborate packaging with big imagery, product information, and just a spacious and relaxed design. It’s lovely. Scent: Surprisingly for a Kit Kat with white chocolate, the scent is very much of the milk chocolate variety, but still significantly different than a standard Kit Kat. It’s sweeter, and more artificial. 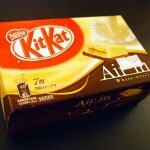 Taste: As with the Air-In Green Tea Kit Kats, really disappointing. My biggest problem with the Green Tea was the waxy texture, completely different than a standard Kit Kat, and that’s duplicated here. I find the taste of both the milk chocolate and white chocolate to be really unappealing and “off” as compared to the regular bars, and again, the air-in aspect does nothing at all. This is much closer to the cheap and unappealing chocolate of Fujiya in their “Look” bars than anything to do with Kit Kats, and the flavour is unappealing and, worse, unintersting. 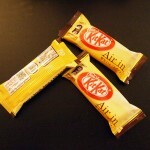 Verdict: I will say this for Nestle, this particular Kit Kat is a unique product that has almost nothing to do with a standard Kit Kat. Unfortunately, it suffers for it any way for the lack of familiarity. 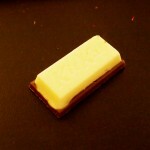 Seriously, awful chocolate, a pointless gimmick in the “Air-In”, a mediocre flavour… Really, the only thing in its favour is the 40 calories and 22 yen price per finger, but if you’re gonna have a little hit of chocolate why not eat something good instead? 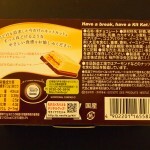 Pingback: » Review: “Air in” Green Tea Kit Kats Oyatsu Break!